You and I dream of bikes with limitless power and technology. But we all know deep down that bigger and faster isn't useful in India. They're harder to ride and apart from bragging rights, the amazing power has miniscule advantages. So how much power, do you think, is just enough? I know we all have our own answers to that question but I believe the answer is on these pages. We have motorcycles here that span 72 and 125PS and I'm convinced that if you need more, you're nuts. If you want less, though, there's a persuasive argument for a light 50PS motorcycle but I'd say you're setting the bar a bit low. Let's meet the cast of our show. The 72PS Kawasaki Ninja 650R birthed the middleweight naked segment in India. It is a competent bike and its price, to this day, remains the benchmark. The other twin is Ducati's Scrambler which has a significantly larger engine. A genuine, if whimsical Ducati, the Scrambler is rapid in performance but laid back in approach. A very different way to do a sporty mid-weight. The inline fours begin with the Benelli TNT 600i that also boasts a pretty special price. It also sounds illegally good with its stock exhaust. The Honda CBR650F boasts a larger engine as well as a slightly higher power output but the CBR is a proper Honda. It's well made and in theory, even an arthritic granny could ride it respectably fast. The final four is the Kawasaki Z800, another motorcycle that boasts a good price, good power and a calm disposition. The odd one out is, as usual, the Triple. The Triumph Street Triple is a hot favourite the world over though the 85PS (79PS as per ARAI) spec sold here simply isn't as effervescent as the genuine 106PS one. We failed to source a bone-stock StTriple and decided to go with the Arrow-ed and mapped version. This brings about 100PS to the rear wheel (106PS at the crank, says the Interweb unless you remove the db killer) and adds `40,000-odd to an already high price. Can the goodness of the Triumph overcome its pricing? Just one of the questions facing us. Finally, we drafted in the MV Agusta Brutale 800. Now Kinetic-MVA have made clear that since the B800 needs homologation, it's on-sale date isn't any time soon. But how could we resist the idea of a full-on sporty 125PS naked motorcycle, eh? The challenge for the mid-weight is to have a sense of panache that appeals without intimidating. 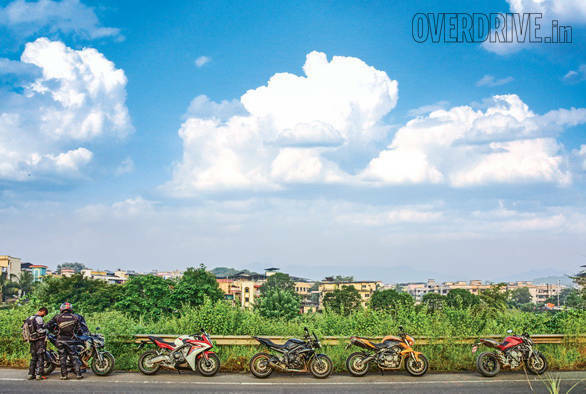 This is important because these are the motorcycles that nurture blossoming passion in new riders. 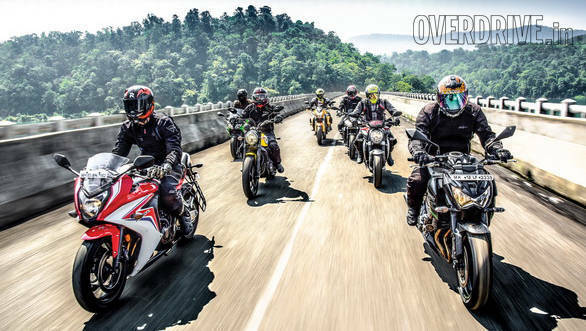 These motorcyclists are on their way to being lifelong riders. You want to lead them forward but not scare them off. That's one of the issues with the Benelli. Its styling is a little anonymous and a little old-school sportsbike. It's sad that its Italian brothers, the 899 and the 1130 both boast decade old designs that have far more flair than the stodgy TNT 600i. In that sense, it isn't TNT, it's H2O. 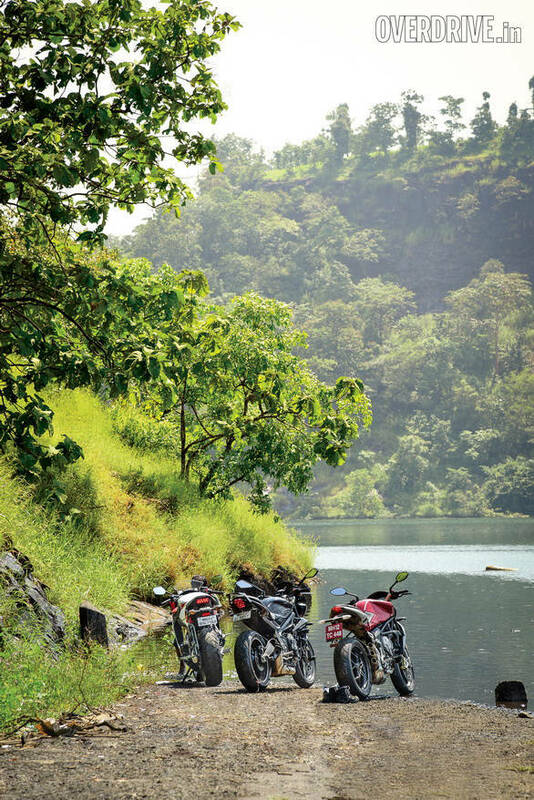 However, India's mid-weight buyers exhibit a strong aspirational streak and the Benelli does have something for them. It looks and feels physically larger than the others. In pure motorcycling terms, this is not ideal. But to a new buyer whose immersion into bikes is more social/visual than in-saddle, big is better and big is cool. The TNT helps itself by offering Italian cool in the twin triangular underseat exhausts and a few other details. The Benelli's build and finish levels are acceptable. Other bikes here are better on both counts but the 600i is made well enough for this not to be an issue. Of course, you do have the option of spending a wee bit more and getting the GT instead  the panniers are optional. I don't think it is pretty but it does look like a newer design and it is distinctive to look at. Come to think of it, that's exactly how I would describe the CBR650F too  distinctive but not pretty. The Honda takes approachable slightly too far and the sportsbike looks dashing in bodywork but a bit too mild overall. I suspect that a sleeker headlamp alone would do wonders for the Honda. However, in quality, the CBR is a full-on Honda. The plastics gleam, panels fit just so and every inch of the motorcycle feels well made and like it will last. The Kawasaki Z800 is close to the Honda though the CBR's plastics are at least a notch or two better across the board. The Z800 is, however, far more attractive to look that. That scowling headlamp looks terrific and the scanty bodywork in black looks very good. The Z800's behaviour is at odds with how aggressive it looks and that might be one of the cleverest things about the Kawasaki. Finish levels are a notch behind the Honda but build is excellent. The Ninja 650's build and finish levels match the Z800's. But the design is far more in tune with its nature. It's now an old design but it looks calm, purposeful and not too aggressive. The inoffensive design, let's be clear, is neither going to be a decision clincher, nor a deal breaker. In fact, I'd say the N650's design is perhaps the least important thing about this terrific Kawasaki. The Triumph's design is odd. The tank and panels are sharp, smart and modern but the twin headlamp is a little gawky. But over time, Triumph have turned this bug into a feature. It does have utility too  most cars will give way to the Street Triple quicker because of the headlamps. On the flip side, build is decent but finish levels can improve. The Ducati has the strongest styling component here. Aiming for a seventies dirtbike look, the Scrambler stands out, taking a dramatically different approach to a fast, middleweight motorcycle. Finish levels are much better than many current Ducatis but odd details like retainer springs on the exhaust  not just on the Scrambler  are baffling. However, unlike any of the other motorcycles here, the focus on design ends up making the Scrambler the least practical of the bikes here in some ways  we'll come to that. Build quality is very good and I suspect that the Ducati will stave off rattles from our roads for a long time successfully. That brings us to the MV Agusta. So pretty! People naturally gravitate to the red-silver beauty and there's a lot to look at, including the lone single-sided swingarm amongst this crew. As Italian bikes should, the MV has a wealth of small details that show a remarkable attention to finish and design that elevates the Brutale to a different level of appeal and class. In the same breath, finish levels can improve. There's a veritable waterfall of breather tubes that cascade down the right side of the engine in a callous vee. It makes you wonder ceaselessly, "Why? Why would you just leave them hanging there?" Build quality is good but with springs this stiff, rattle-staving will be a challenge. Let's get economy out of the way. There aren't any stand-outs in this crew. All of these bikes circle the 20-24kmpl overall economy space returning about 16-18kmpl in the city while carefully highway work will show you 28-33kmpl. Economy isn't going to help you choose  which is as it should be. The Benelli TNT600i has the smallest engine. The 600cc inline four makes 82PS but at 231kg, it is also the heaviest here. While the Z800's weight is close, the TNT is, wait for it, 48kg heavier than the lightest bike on this test. Uh oh. The 600i's performance is calm and it posts the slowest 0-100kmph times as well as top speeds  the only bike here that cannot touch 200kmph. However, like we've said before, the 600i is not to be purchased for its performance. It's a glorious sounding 600 that goes quick enough to acquit itself on the highway and the city. The powertrain and its refinement could use more finesse but it's a reasonably good starting point. The Honda CBR650F's inline four should be the goal for the 600i. The Honda makes a little more power  86.5PS, a lot more torque and is among the lighter motorcycles on this test. This results in a smooth, flexible motor that is really good to use as a new rider. Power delivery is strongly linear with utter predictability and it's very friendly. Actual performance is nearly identical to the Ninja 650 in 0-100kmph but the top speed is higher. But Honda's quiet civility is terrific for new riders. The Honda has just one problem, really. 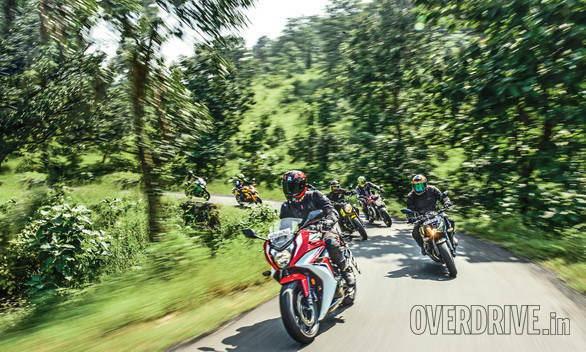 The bars buzz between 100 and 140kmph hard enough to leave you with numb hands within two hours. That's exactly where you tend to cruise Indian highways and it makes the Honda's promising touring attributes fade a bit. The biggest inline four is the Kawasaki Z800. It would've been incredible if it wasn't so heavy. At 229kg, the Kawasaki shows what was lost when the Z1000's aluminium frame was left out and a steel frame bought in instead. 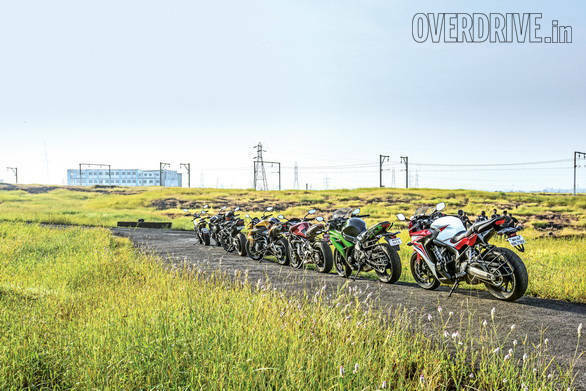 The effect is that despite having 113PS on tap  only the MV makes more  the Z800 is not much quicker than even the N650 to 100kmph. That said, give the Z800 a couple of hours, it'll win you over. The engine is as flexible as a yoga instructor. Speed comes easily to the Z800 and whether you're cruising or negotiating traffic, the Z800's refinement and tractability make it one of the easiest bikes here to ride. The Triumph is similar in nature to the Kawasaki but its personality is stronger and more vibrant. The Street Triple cashes in its 40kg weight advantage by offering genuine performance. Add the exhaust and its song is bettered only by the rabid MV. Top speed is nearly 230kmph  wind protection is sorely needed. But what is lovely about the Triumph is its deep intake roar which is joined by a nice roar from the exhaust. As stock, the StTriple is given to whistling long but that intake roar all on its own, makes it the most satisfying of the bikes to ride here aurally. The engine's spread of power is also pretty broad but tall gearing makes it easy to stall in first gear. But stick in fourth or fifth and you can pretty much do everything. The Scrambler is a surprise. Its tiny dimensions nearly hide the 193kg motorcycle with 76PS on tap. The Ducati runs hard and strong to about 170kmph before power tails off. Like most Ducatis, throttle response is crisp and the big 90° V-twin likes to stay above 4,000rpm for smoothness. In our traffic conditions, the herky-jerky big V-twin behaviour is probably the hardest thing about the Ducati in terms of living with it. Performance is respectable. 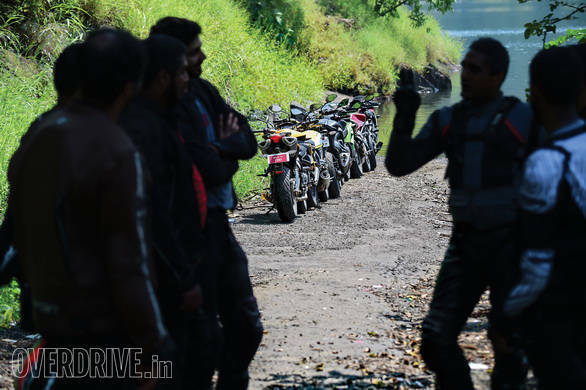 Top speed is 205kmph and at 3.4s to 100kmph, the Scrambler sits firmly in the fast end of the segment. The MV Agusta, though, is the bee's knees. Its 125PS triple is mated to the second-lightest, shortest wheelbase-d motorcycle. The result is madness. Want perspective? The MV has 35kg and 35PS over the Honda CBR650F! 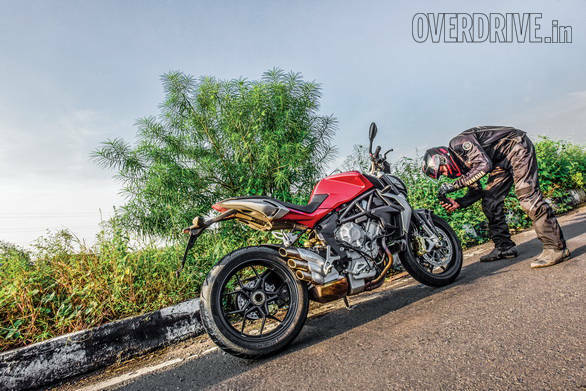 The Brutale is constantly threatening to lift its front wheel, even in sixth gear. The power and torque are constantly being kept honest by traction control. Electric throttle response makes the MV hard to ride on anything less than perfect roads. I found that backing off the throttle response created a far more usable platform without any loss of the incredible power. It's no surprise then, that the MV has the highest power to weight ratio, the highest top speed, a sub-3s 100kmph sprint. It makes everything else here feel flaccid. Flip side? It runs really hot. It's the first motorcycle I've tested where you're conscious of engine heat even at cruising speeds. We didn't get to run the MV through Mumbai traffic... thank god. We begin, once more, at the Benelli. The 600i has the mildest manners and not the most ability here. The chassis turns predictably enough but it lacks refinement and accuracy compared to the others. Braking similarly, is the worst here. The brakes are spongy and feedback is limited. The lack of ABS (across the range, not just on the 600i) is a huge deal. The good thing is the ride. The 600i is soft and it absorbs our roads well. The suspension setup isn't terrific but the softness and the weight combine to produce a welcome result. The Kawasaki Z800 shows how soft should be done. The Z800 is sprung well but feels almost plush. 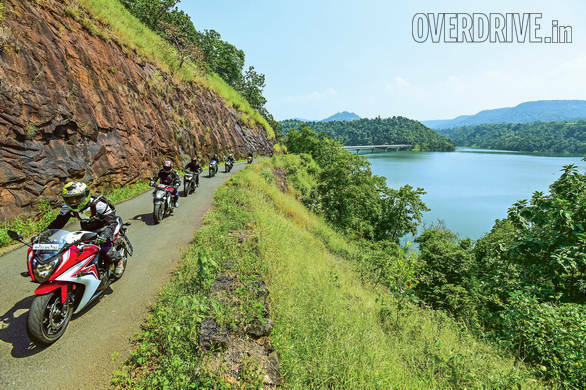 Bad roads are handled well and the Kawasaki is amongst the most comfortable of the bikes here over practically any kind of terrain. The Z800 feels long in corners but it understands how to use that to its advantage. It doesn't turn in especially quickly but it is super stable mid-turn. The trick is to enter slow and use the engine's torque and flexibility to drive out of corners with authority. 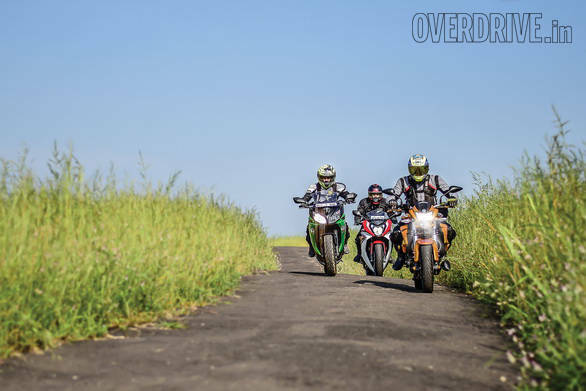 Get this right and the Z800 will work its rear tyre hard  and it feels great to ride like this. Brakes are friendly and strong and we like the fact that ABS is now standard. The Triumph is similar but with far greater agility. While the Z800 does have rebound adjustment available front and rear, the Triumph only has preload on the rear monoshock. But it's a good base setup. The Triumph is plush on good roads and has the ability to handle bad roads too. What it doesn't like are sharp bumps which the forks struggle with a bit. The short wheelbase and the sporty nature give the Street Triple very, very good cornering capabilities. It's the happiest motorcycle here by a margin in the corners and it is sporty without requiring the rider to be very skilled. It's a marvellous balance and the Street Triple's enduring popularity and worldwide acclaim aren't hard to grasp. Also tremendous are the ABS brakes which offer incredible force and feedback. They're the best here barring the MV, no question. The Ninja 650, in fact, isn't quite as capable but has that one thing missing from the Triple  indestructibility. The N650's suspension feels cruder than everything but the Benelli, but it's up to the job. The bike feels like it cannot be broken by roads and potholes and that's a wonderful feeling. As a result, even when the road is getting uncomfortably broken, the N650 can be pushed hard. However, while a friendly, confident handler, the N650 feels a bit heavy in the corners and not particularly sporty. It's the Honda that really nails the balance between sporty ride and handling. Its ride quality is well damped but not plush or wallowy. It absorbs more than you think it possibly could without feeling soft or wallowy under almost any condition. And yet, its handling is utterly neutral  it goes exactly where you point it and its reactions are both predictable and natural. The Triumph and the Honda, in this sense, are easily the motorcycles here with the greatest range in terms of keeping riders of all skills engaged and riding. Brakes are very, very good too  almost as good as the StTriple. The Ducati Scrambler is different. It's very direct as bikes with wide bars tend to be and it turns much harder and grips a lot better than its block-pattern tyres suggest. Brakes are sharp and the ride is stiffer than you initially imagine. That said, it is the only bike here with any real soft-road ability and the Scrambler's charm is unique and immensely enjoyable. Which brings us to the MV which is pure intensity. The wheelbase is dramatically shorter than the other bikes and that combines with its light weight almost too well. On perfect roads, the MV is uncatchable. It falls to deep lean angles in an instant and its grip and the feedback from the rock solid chassis are unmatched. Hard drive out of corners, tempered by traction control make the MV incredibly fast in and out of corners. Lovely and unrelenting! When the roads are less than perfect though, the MV is a handful and actively scary. The stiff suspension gives it a rock hard ride quality and the MV is constantly lifting wheels over crests and feeling skittish. Mid-corner bumps, similarly, are troublesome and riding the MV fast on stock settings requires great skill and concentration. I suspect that the hidden blessing here is that the MV gets fully adjustable suspension so it should be possible to find a more supple, softer setting that works on our roads. But as it is, my word, the MV's an eye-openingly gung-ho motorcycle and requires absolute commitment and skill. I desperately want! I don't think riders in this segment should be purchasing bikes without ABS. And that flatly rules out recommendations for the Benelli 600i and the Ninja 650. The Benelli feels like an older design and is at the bottom of the spectrum anyway but look at the price and its value proposition. It is exactly the same price as the Ninja and offers an inline four  something Indians are crazy about. Finding the Ninja 650 at the bottom, though, is genuinely heart breaking. It's a wonderfully priced, extremely capable machine and if I had one, I'd ride it everywhere without a care in the world. With ABS, it might have been second or even tops in the comparo, but without ABS, I just cannot recommend it. I'd love to recommend the Brutale 800 but Kinetic is pretty clear that the B800 isn't coming anytime soon. Our guess would be a price around the Rs 15 lakh mark and that's a lot of money. But for the money, the MV is an intense experience with the full gamut of electronics, enormous power and a light chassis that really dances. It is a beautiful motorcycle, no doubt. Similarly, the Ducati Scrambler, the other Italian machine is hard to put into an order here. It's a dramatically different experience. The Scrambler is fast and capable. It's a hard motorcycle to tour on though  there is no wind protection and mounting luggage is surprisingly hard. Our test bike also happens to have the worst seat of this test. What you should also know is that the Scrambler is a premium bike despite the Classic costing under Rs 8 lakh  not the highest price here. Service, for instance, costs twice as much as the Triumph and in that sense, you are buying a genuine premium motorcycle. It's a thrilling ride but it's a much more specific flavour than, for instance, the 821 Monster. 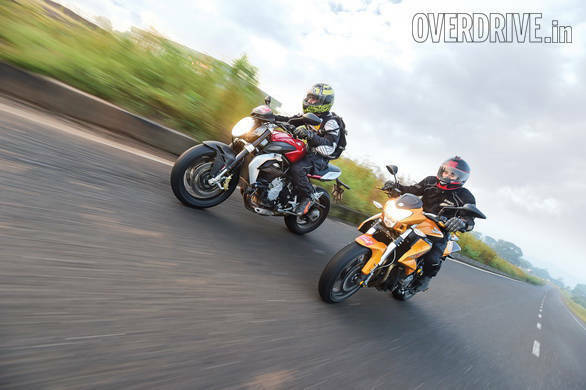 The top three, then, is between the Honda CBR650F, the Triumph Street Triple and the Kawasaki Z800. And it is a tough battle. The Honda comes third. The CBR650F is extremely capable and extraordinarily friendly. It'll corner harder than you think, do worse roads than you planned for and deliver a swift, satisfying ride. But the Honda looks meek, buzzes a bit and worst of all, is uninvolving to ride. 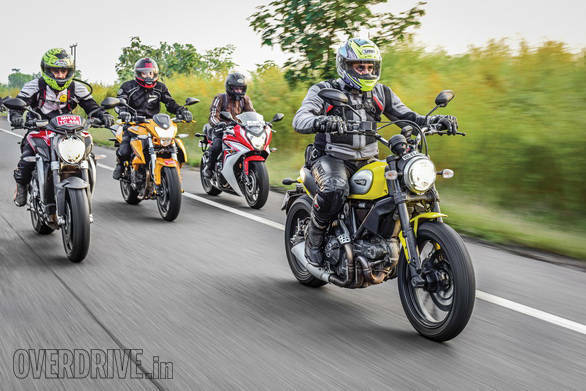 It is a motorcycle you'll be besotted with after years and years of riding  and I suspect that the lion's chunk of middleweight motorcycle buyers aren't going to keep any of these bikes for years and years. For its Rs 8.25 lakh (on-road Mumbai) price tag, the Honda also happens to be an expensive purchase, offering far less equipment than the Kawasaki and noticeably less performance than the Triumph. The Triumph comes in second. Which is primarily down to its optimistic price. The stock Street Triple is Rs 9.3 lakh on-road Mumbai and adding the exhaust takes that to Rs 9.6 lakh. That's not a small amount of money. If the money isn't a problem, you'll get the best motorcycle of this group. The Street Triple can be as calm and friendly as the Honda as well as nearly as intense as the MV, depending on your mood. Its intake noise, ride quality, handling as well as its brakes are absolutely terrific and its light weight makes all of these abilities (except noise, which isn't related) shine harder. To make it a genuinely capable all-rounder, budget another Rs 15,000 for wind protection at the minimum, though. The best deal of this lot, then, is the Kawasaki Z800. At Rs 8.7 lakh on-road Mumbai (Octroi), it's Rs 50,000 less than the Triumph but that's not the whole story. 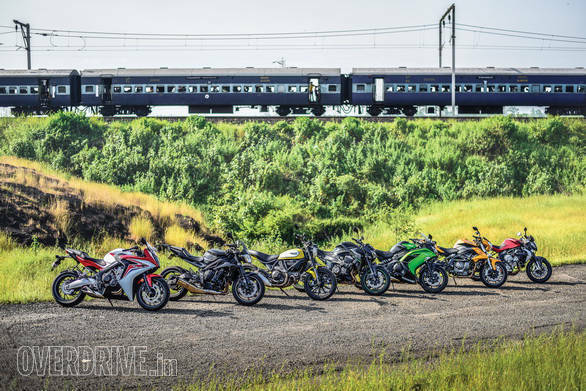 It seems the Kawasaki is `40,000 more expensive than usual specifically in Mumbai so in all other places, expect the Kawasaki to be Rs 90,000-odd less than the Triumph. For the money, you get a civil motorcycle with immense ability and appeal, adjustable suspension and that amazing looking design. Like the Triumph, keep Rs 15,000-odd in hand to add some wind protection before heading out on one of the best touring motorcycles in the country today.